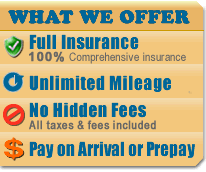 Rent a Car in Rhodes (Rodos) Greece, car hire in Rhodes Greece by Universal Rent-a-Car. Find the lowest prices on car rentals in Greece, online reservations for budget economy travel to Greece and the Greek islands, Crete, Santorini, Corfu, Mykonos, Athens, Thessaloniki, Lesvos, Kos, Samos, Halkidiki, and Zakynthos, mietwagen in Kreta Griechenland, autovermietung, location de voitures. 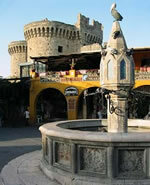 The city of Rhodes (Rodos), at the north end of the island, presents a dual face. The old town is encircled by medieval castles; there are narrow lanes, stone mansions, churches, the Knights' Castle, Knights' Hospital and the Castello. Then the new city extends beyond these suggestive walls - with its wide streets, beautiful buildings, glamorous hotels and shops full of characteristic items of Rhodian folk art.